A Nairobi based lawyer has come out to claim that he went to heaven and dined with God. 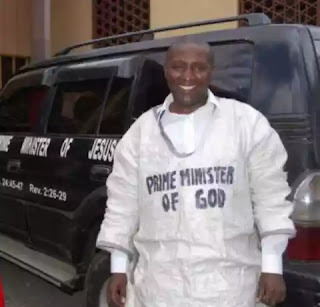 Mwangi claims that Jesus asked him to drop his expensive suits and instead wear a sackcloth with the writings ‘Prime Minister of God’ on the front and ‘Waziri Mkuu Wa Mungu’ on the back. “This is what God has told me to wear. I am one of two prophets who were prophesised to be Jesus’ witnesses,” he reportedly said while referring to the Biblical prophecy in the book of Revelation 11:3 and Isaiah 18. According to Mwangi he knew God had appointed him after he had his first dream when he was in class five, in which God allegedly revealed to him that he will perform a big role during the second coming of Jesus Christ. “The dream became more vivid in 1985 when I was a second-year law student at The University of Nairobi. He open the Book and read to me that together with another pastor, we should prepare the earth for His second coming. He dropped me from heaven and the next day, I found myself in bed. When I told my friends they all thought I was insane,” he said. “On December 9, 2006, God told me that I will prophesise and lead people to the Kingdom,” said the father of six and a husband to two wives.